Not getting any CPU units. Message boards : Number crunching : Not getting any CPU units. Message 49941 - Posted: 18 Jul 2018 | 5:26:50 UTC - in response to Message 49940. If I am not mistaken, the CPU tasks work on Linux only. Yup, I see you only have Windows PCs. Message 49945 - Posted: 18 Jul 2018 | 14:55:57 UTC - in response to Message 49941. Well, that would explain it! But how am I supposed to know that? I haven't seen anywhere on the site that shows what applications are available for which systems -- or even what applications are available period, for that matter! Message 49946 - Posted: 18 Jul 2018 | 15:06:28 UTC - in response to Message 49945. 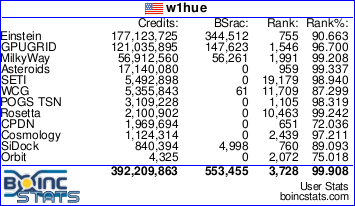 The standard BOINC format works, but isn't linked anywhere. It's a bit of a mess at the moment, because the Windows GPU apps have been removed. Two older Windows CPU (Quantum Chemistry) apps are listed, but I think they failed to work and have been discontinued. There is a Windows Beta QC app shown, which may still be active. Message 49947 - Posted: 18 Jul 2018 | 17:15:39 UTC - in response to Message 49946. Message 49949 - Posted: 18 Jul 2018 | 18:19:40 UTC - in response to Message 49947. If you're familiar with the standard suite of boinc tools from any other project, you can type the addresses manually - doesn't have to be a link. Message 50027 - Posted: 24 Jul 2018 | 5:10:10 UTC - in response to Message 49949. Some of us just arn't that smart . . .
i run on linux but cant get cpu wus. Message 50174 - Posted: 31 Jul 2018 | 17:19:17 UTC - in response to Message 50173. Maybe your Linux kernel is too old. Can you upgrade it? how can i doo this? Message 50176 - Posted: 31 Jul 2018 | 17:37:27 UTC - in response to Message 50175. This depends on your distribution. On mine (OpenSuSE) I have a Yast tool which allows me to make a software update, but most of the times I get the updates from SuSE which asks me if I want to install them, unlike Windows 10.
oh is it posible that i need x64 linux? Message 50178 - Posted: 31 Jul 2018 | 17:54:13 UTC - in response to Message 50177. Message 50260 - Posted: 19 Aug 2018 | 19:00:30 UTC - in response to Message 49946. I see a list of projects that are supposed to be working in Windows 64 bit platforms. However for quite some time now I am not getting any tasks. I reset the project and there are still no tasks for Windows 64 at least for my computer. Any ideas whats going on? No CPU and no GPU tasks. Just not tasks are available. When GPUGrid's Server Status says that there are no Unsent tasks of a given Application, that means that the scientists have no work available for that Application. At the top right of any page, click Server Status. Sometimes, our CPU and GPU resources will have to work on work from other projects. Message 50270 - Posted: 21 Aug 2018 | 7:02:03 UTC - in response to Message 50260. I reset the project and there are still no tasks for Windows 64 at least for my computer. Any ideas whats going on?